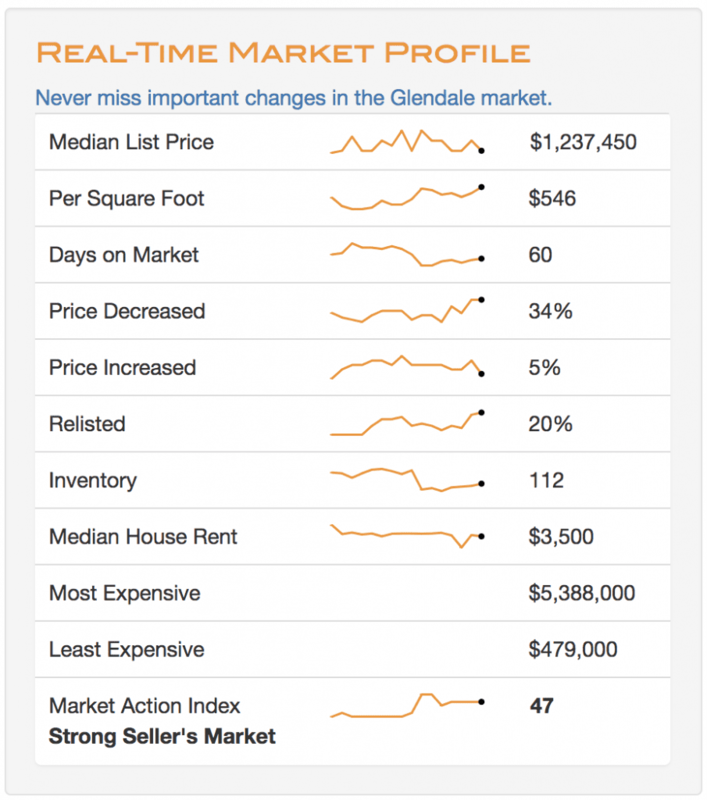 I struggle with Market Reports for Glendale CA homes. They are either so simplistic they are meaningless or they are nerdy/geeky complicated. My goal has been to deliver relevant and useful information on how the market is doing on a regular basis. Introducing the DIGGS Market Report. For the quick answer to “How’s The Market?” take a look at the Market Action Index. This number takes into account several different data points to create this useful indicator of the current market dynamic. For more context and information we have the Market Profile. This gives us several individual metrics in a trend graph so we can see where we are relative to where we’ve just been. I am particularly interested in the rate of price decreases. I think the rise in price reductions indicates a softening in the market. We have the rest of the report. This interactive report allows you to slice and dice the data in dozens of ways with just a mouse click or two. Or, a poke of the finger, if you are on a mobile device. I absolutely adore how easy it is to view different segments of the market. So often the upper end and the lower end are completely different. For example, look at the chart above. The low end is experiencing relatively few price reductions while the upper end shows a definite softening in price. I love that search bar. It means that I can compare and contrast any neighborhood or city in the continental United States. Want to find out what’s happening in your Great Aunt Mathilda’s neighborhood? Go for it! This report is updated weekly. Our real estate market is incredibly dynamic and you don’t want to miss out on the changes. Subscribe to any of the offered reports and you’ll get weekly updates straight to your inbox. This is perfect for the casual observer to the motivated person looking for the ideal “time”. As always, your information is private and we would never share or sell it to anyone. Check the areas of interest and we'll send each report in a single email once a week.